On Saturday, November 6th, Back Stage™ merges with one of our famous Film Industry Bashes at J LOUNGE in Los Angeles to bring you the Official Actorfest® After-Party. This annual event is the ultimate networking opportunity for showbiz professionals from all corners of the industry. Join us for an exciting night of mixing, mingling and fun at one of LA's most-exclusive venues! THIS PARTY WILL SELL OUT - REGISTER TODAY! No outside food or drinks allowed. Must be 21+ to attend. RSVP fees are non-refundable unless event is canceled or postponed. No cash at the door - must pre-pay online to attend. Event details subject to change. RSVP fees solely cover reservation on the guest list and do not include food or drinks. Guest list will be cut off at capacity or 1 hour prior to event time, whichever is first. Guests are encouraged to bring business cards, headshots, postcards and other promotional materials to the party. 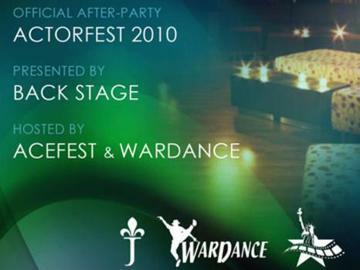 J LOUNGE and ACEFEST reserve the right to remove patrons from the venue for inappropriate behavior or misconduct.